Large, low-cost stores have a history of displacing local businesses and monopolizing the local economy. According to Wal-Mart’s Economic Footprint: A Literature Review Prepared by Hunter College, Wal-Mart results in net job loss. The store siphons money from the local community and decreases retail employment in each county it enters by almost 3%. Chain stores only re-circulate 43% of each dollar spent to the local community, as opposed to 68% of each dollar spent at local retailer. In an already impoverished area, this decrease of local revenue could be devastating. According to a demographic study published by the Chinatown Community for Equitable Development and UCLA, the poverty rate for Los County is 13%, yet almost half of the families in Chinatown live below the poverty line. Aside from showing a great economic disparity, this statistic indicates that Chinatown needs a sustainable economic solution that creates long-term employment. Though Chinatown has a large community of retirees, this does not fully account for the alarming rates of poverty. According to the demographic study, half of Chinatown’s population is currently employed yet many workers lack stable jobs. The net loss of jobs and competition that Wal-Mart brings to Chinatown has to the potential to overwhelm the local economy and drive the area deeper into poverty. In a press statement, Wal-Mart reported, “Local residents…have been waiting for more than two decades to bring a full-service grocery to this part of Los Angeles.” Despite the company’s assertion, downtown Los Angeles is not a food desert. The Chinatown Community for Equitable Development (CCED), published a map highlighting the area’s established grocery options. All eighteen of these stores are independently owned and reflect Chinatown’s character. In addition to competing with mom and pop grocery stores in Chinatown, the new Wal-Mart might pose of threat to the Ralph’s located near the Staples Center. Despite its proximity to the recently opened CityTarget, on South Figueroa, Steve Restivo, Wal-Mart’s senior director of community affairs, told the Los Angeles Times that the store fulfills an immediate need. Though it seems plausible that local impoverished residents might benefit from low-cost groceries, Wal-Mart only provides a temporary solution. Instead of addressing the underlying issue of Chinatown’s lack of stable employment at a livable wage, Wal-Mart worsens the problem. According to Wal-Mart’s Economic Footprint, Wal-Mart’s annual salary ($20,774) is below the Federal Poverty Level for a family of four. Instead of alleviating poverty, these jobs only add to the number of working poor. Additionally, Wal-Mart has a history of hiring non-union workers who do not belong to the local community. Clearly, the Chinatown Walmart shows a disregard for the interests of the majority of local citizens and does not provide a long-term solution to the issue of poverty. In addition to its economic impacts, the arrival of large chain stores changes the character of Downtown Los Angeles. According to the Los Angeles Times, this Wal-Mart is the chain’s seventh store in Los Angeles. In a radio broadcast by Southern California Public Radio (KPCC 89.3), Jenny Schuetz, an assistant professor at USC’s Price School of Public Policy, described the influx of chain retailers as a result of the downtown’s changing demographics. U.S Census data indicates that over 50,000 currently reside in downtown Los Angeles. While this influx of people undoubtedly changes the area, big-box retailers speed this process and negatively impact people in the immediate vicinity. According to CCED, Wal-Mart will increase rents and might make Chinatown unaffordable for long-time residents. According to the CCED-UCLA demographic study, real estate developments like the Orsini Apartments will flock to Chinatown. In an area where 94% of residents rent and many struggle to meet their monthly payments, this is not an idle fear. Furthermore, the Los Angeles Times reported that “new businesses have opened…nearby in anticipation.” Despite the positives of economic growth, retailers that open up around Wal-Mart tend to be chains with little affiliation to the community. The Los Angeles Alliance for a New Economy is filling a lawsuit against Wal-Mart and has a tentative court date set for April 2014. 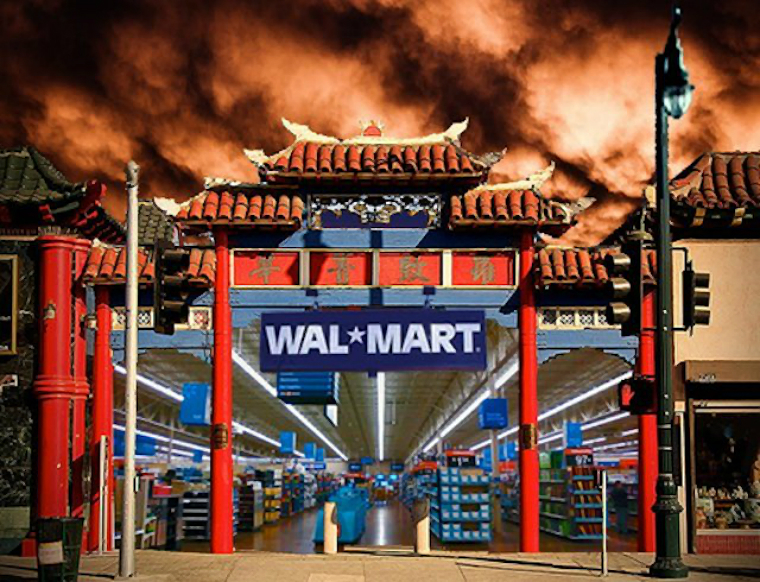 Aiha Nguyen, director of the Grocery & Retail Project for LAANE, told the Los Angeles Times “Wal-Mart bullied its way into Chinatown.” The lawsuit charges that Los Angeles Department of Building and Safety exempted Wal-Mart from an environmental review without notifying the public. The Chinatown Community for Equitable Development echoed this message, citing increased pollution and traffic as some of Wal-Mart’s negative impacts on the community. In addition to CCED, the Los Angeles Chinatown Business Council also focuses on revitalizing the area through local business collaboration and community effort. Local businesses not only bolster the area but also provide variety and local culture. Both organizations promote economic activity while preserving the local history and charm of the area. Programs such as the Los Angeles Chinatown Business Council’s “The Undiscovered Chinatown Tour” series and holiday festivals serve a dual purpose of promoting local flavor and stimulating the economy. By working with businesses on a grassroots level, CCED and the Los Angeles Chinatown Business Council improve the community from the ground-up. Though it appears to prevent chain retailers from infiltrating historic downtown, locals can show solidarity with local businesses by supporting their efforts and send a message to big-box retailers, such as Wal-Mart. Editor’s Note: Rebuilding Troy encourages contributions from all USC students regardless of program or major and we remain committed to showcasing a diversity of viewpoints. The opinions expressed in this forum are not necessarily those of the editorial panel or USC Price.